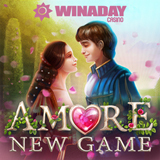 There's a new designer on WinADay Casino's in-house game design team and she's created quite a masterpiece in the romantic new Amore slot that the unique casino launched for Valentines Day. The former children's book illustrator has created a magical tribute to the most famous lovers of all time, Romeo and Juliet. Meanwhile, her technical counterparts have built a game with an amazing two-stage bonus game with potential for some super payouts! WinADay is offering an up to $21 freebie and up to 200% deposit bonuses to players that want to take a spin down lovers’ lane. Introductory freebies and match bonuses available until February 20, 2017. Amore’s scatter symbol – the famous Shakespearean lovers themselves -- pays out instant cash prizes of up to 10X the bet. Three or more Scatters trigger the game’s two-stage bonus game. Players first pick from a series of ornate masks like those worn at the Capulet’s ball where Romeo and Juliet first met. Mask picks determine how many free spins begin after that. Some masks reveal prize multipliers for the free spins, while some unveil an instant cash prize. Betting from 60 to 750 coins, each worth one cent, players can wager as little as $.60 per spin or place a max bet of $7.50 per spin. 10X wagering requirement; valid for all slots and keno. All players that have made at least one prior deposit are eligible for the $10 free chip; VIP players can claim a $21 freebie. 20X wagering requirement; $35 min. deposit. Valid for the new Amore slot only. 15X wagering requirement; $35 min. deposit. Valid for any slot game in the mobile casino. 12X wagering requirement; $25 min. deposit. May be used twice a day. Valid for valid for all slots and keno. Found only at WinADay Casino, Amore is available in its instant play online casino for desktop and laptop computers and is also featured in its recently upgraded mobile casino for smartphones and tablets.